#127) THE NARRATIVE METRICS GAME: How Will Trump’s State of the Union Score? 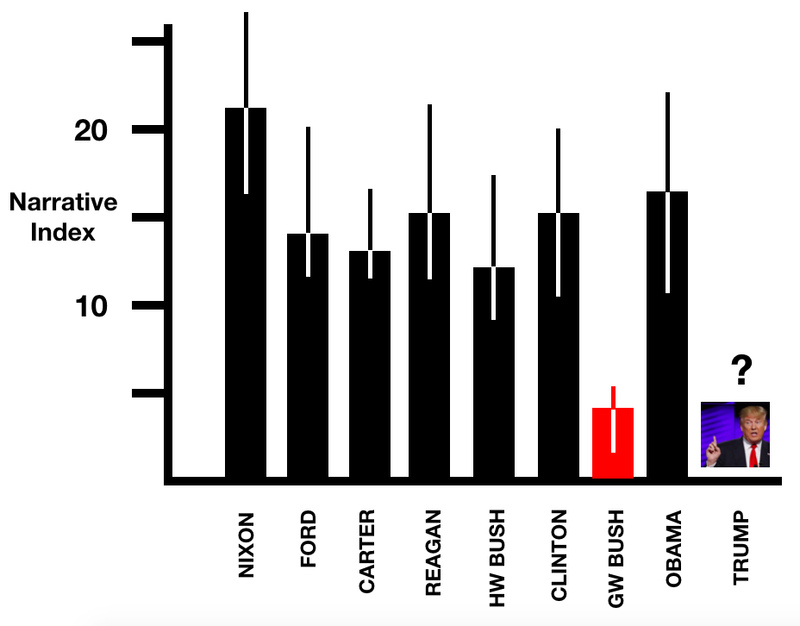 The Narrative Index (BUT/AND x 100) is not super-precise but certain patterns do emerge— like Nixon’s fierceness and George W. Bush’s stunning blandness. When Trump writes his own material, his values are high (over 20), when others write it for him, they’re low (around 10). I’m predicting he’s around 10 to 15, and with an And Index that is closer to the score of journalists than research reports. STATE OF THE NARRATIVE. The error bars represent the range of values for the State of the Union speeches of the past 8 presidents. George W. Bush was the ultimate “And, And, And” president. His AND INDEX (% of words that are “and”) averaged 4.7, which is right up there with World Bank reports (= Zzzz …). Nobody wants to give in to the simplicity of these two little metrics yet. Last year World Bank Chief Economist Paul Romer was booted from a committee for trying to use the AND INDEX. But with time the “experts” will come to realize they’re real. I’ve gotten tired of trying to interest journalists in them — they apparently think there can’t be this sort of meaningful simplicity in the world. The Narrative Index usually has a fair amount of noise around it, but there are some patterns that are undeniable. Nixon’s first inaugural speech scored a blazing 46. That’s the highest I’ve ever seen for any speech. After waiting a lifetime to be president, he was roaring with pent up frustration. Eisenhower’s State of the Union speeches went from bland in his early years (6, 6, 5, 5, 7) to feistier in his last three years (19, 11, 12) as he foretold the impending perils of the military industrial complex. But the biggest shocker is George W. Bush who never scored above 5 in his State of the Union addresses. He was a nice fellow who just didn’t want to push anybody (which is what’s happening when you use the word “but” a lot). I’m guessing Trump will be around 15 for the Narrative Index and 3.5 for the And Index. Tune in the next morning, I’ll tweet what it is.